Product #30540 | SKU LBA2 | 0.0 (no ratings yet) Thanks for your rating! 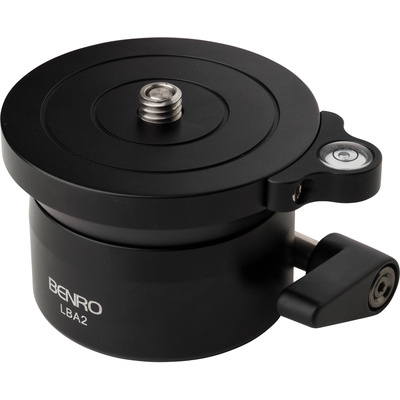 The Benro LBA2 Levelling Base is ideal for creating stitched panoramic images that require a level base for your pan head or ball head. It has a load capacity of 50 kg and can tilt +/-15° in any direction. The top of the levelling base has a spring-loaded 3/8"-16 threaded stud that can be recessed to reveal a 1/4"-20 stud, allowing you to mount a head or a camera directly to the levelling base. The bottom mount is a 3/8"-16 female thread with a 1/4"-20 bushing adapter.